Being obliged by KYC and AML regulations to verify users’ identities for capital deposits, centralized crypto exchanges enable users to transact currencies even to fiat. By allowing such centralized record collection along with centralized data and liquidity reserves storage, these platforms sacrifice the potential for a permissionless ecosystem. And while the main idea behind cryptocurrency was the creation of this very network for trustless permissionless interactions, decentralized exchanges are here to embody those bedrock principles of crypto. A decentralized exchange (DEX) is a partially-automated asset exchange platform where no third-party escrow intermediary holds the funds of the transaction participants at any stage. On the architectural level, it means that there are no centrally-controlled servers, and the networks’ nodes are distributed, eliminating a single point of failure. In order to legitimately label an exchange as fully decentralized (DEX), one must ensure that each of the platform’s core functions isn’t centralized: capital deposits, order books, order matching, and asset exchange. Most of currently operational DEX’s decentralize the latter, as the assets exchanged are cryptocurrencies deployed on the public blockchain. Meanwhile, the other three functions usually remain centralized1. Unfortunately, there’s no easy way to determine the level of decentralization of a certain DEX unless you’re ready to delve really deep into the project’s inner workings and technical documentation, which, on top of it, often either isn’t freely available or of dubious quality. There’s no doubt, a DAO (Decentralized Autonomous Organization) would be the ideal model for a DEX (a trustless, code-represented stakeholder-controlled complex dApp). In addition to full decentralization of all four aspects of the exchange, in this case, users would acquire the decision-making power over the platform. There is, however, one setback to the current state of any DAO — Proof-of-identity. And although there are some Decentralized Identity2 projects like Sovrin, Civic and Identity.foundation, they aren’t the mainstream yet. Currently, many supposed DEX’s are still using email sign-ups, which is a heavy argument against full decentralization. What kind of decentralized exchanges there are? There are two fundamental exchange models: currency-centric and currency-neutral. Currency-centric exchanges are built on top of a singular blockchain platform. By design, they are limited to escrowing the native platform currency exclusively (in the case of Ethereum it would be either, any ERC-20 token or another contract). The traditional exchanges are also built this way, except for the blockchain part, of course. The newer approach is currency-neutral, designed to connect different native cryptocurrencies, which frees users from being tied to any particular currency ecosystem. Currency-neutral model allows users to trade cryptocurrencies without a coin underlying the platform actions, executing a fully peer-to-peer exchange. DEX’s built according to this model are empowered with securely matching and handling order books through broadcasting and matching the orders directly on the blockchain. A trustless marketplace is created by realizing order matching through smart contracts acting as a trustless escrow and then launching an “atomic swap”3 from one matched peer to another. Bisq, altcoin.io, and flyp.me are the examples of such platforms. As the reports show, hacking of cryptocurrency exchanges and trading platforms has jumped 250 percent in 2018, reaching $927 million. Since famous hacks of MtGox and Bitfinex, cryptocommunity became more cautious about security aspects of the exchanges. Such massive security attacks targeted the centralized hot wallets of the exchanges — a single point of failure, which truly decentralized exchanges don’t have by design. Thus, DEX’s can provide increased security as they are potentially more difficult to hack. 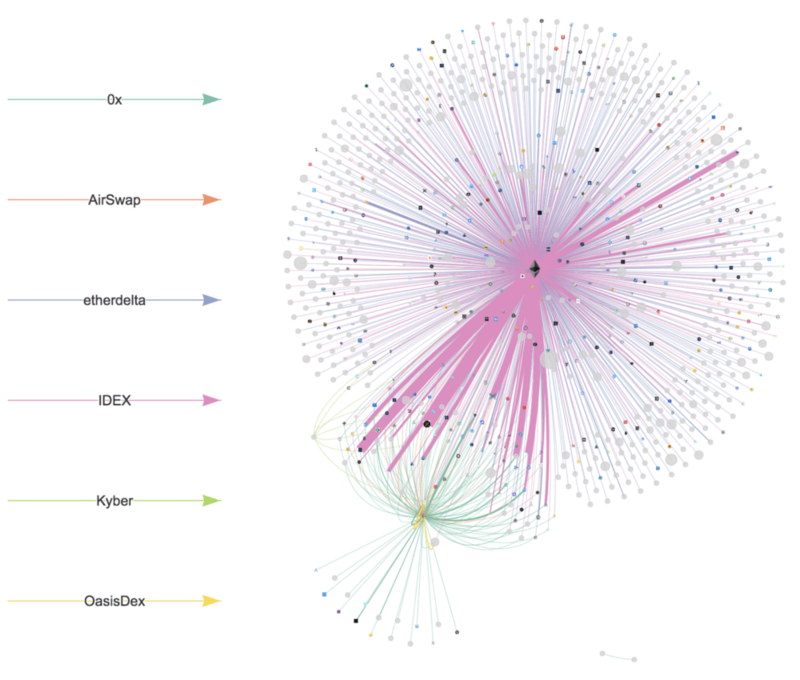 However, many DEX’s of today are hybrid in reality, and their partially-centralized architecture still present vulnerabilities. Decentralization offers the potential censorship-resistance, meaning that no central authority could forcefully impose regulations on the exchange or the currencies in it. The DEX users can trade any token supported by the blockchain platform or protocol it is built on. With proper technical development and tight cryptocommunity support, DEX’s might present a firm stand in the light of hostile countries’ like China or India clampdowns on cryptocurrency. Due to the absence of the third party authenticator, a DEX architecture was conceived to facilitate faster and cheaper transactions than a centralized exchange. However, this theoretical advantage is yet to be proven on a large scale, as decentralized exchanges haven’t yet amass enough users to achieve the “network effect”. One of the major obstacle towards the mass adoption of DEX’s is the high entry threshold. To start trading on DEX requires a little more sophisticated knowledge of cryptocurrency space than to setup an account on a centralized exchange. Furthermore, there’s still a long way to go in terms technical realization before any DEX could offer the same functionality that the users of centralized exchanges seamlessly enjoy now: more advanced trading tools and features such as margin trading or stop loss are much harder to securely program in a truly decentralized p2p fashion. Every cryptocurrency user needs to understand the difference between a DEX and a centralized exchange in order to choose the best tool for their needs. And however attractive their value proposition might sound, decentralized exchanges are not for everybody. For instance, it’s way easier to find an ICO token traded on a decentralized crypto exchange rather than a centralized exchange, since their listing process is more open and straight-forward. Moreover, the advantage of less trading fees might only be perceptible when the deal is for a considerable amount of crypto assets. Therefore, if you are not trading ICO tokens or buying large amounts of cryptocurrency there might still be little or no advantage to using DEX’s in their current stage of development. Likewise, more advanced traders would probably be better served by centralized cryptocurrency exchanges, which offer a considerably wider range of trading instruments. And, of course, as any DEX is not a storage solution but a trading mechanism, any DEX user should have another method to store their cryptocurrency (such as a hardware wallet or another digital wallet). Tracking DEX’s volumes, user base and development is in any way a piece of cake. Due to their specific architecture and various blockchains, there isn’t single reference list like CoinMarketcap for DEX’s. The most comprehensive one, DappRadar, monitors 73 exchanges only on Ethereum, EOS and TRON blockchains. Other trackers are either of limited capacity like DexWatch or community-curated like INDEX. EtherScan can offer you a transaction number statistics on the 23 biggest decentralized exchanges built on Ethereum, but not their transaction volume. Out of more than 300 existing DEX’s, as many as 35 are listed on Coinmarketcap, yielding together just 1.29% of the daily trading volume4. And there’s no surprise that most of the biggest decentralized cryptocurrency exchanges are Ethereum-based. According to Consensys Research5, IDEX and EtherDelta both enjoy more than 80% of all trades of ERC-20 tokens and host more than 95% of the traders. They also are the 2 major Dex’s with respect to diversity of token-pairs traded. Although Ethereum blockchain is still the king, some new Dex’s on EOS and TRON blockchains occasionally outperform IDEX and other Ethereum-based centenarians on DappRadar in terms of daily and weekly volume in USD equivalent. More and more blockchain platforms are catching up on the DEX race. The beta-launch of Nash, a decentralized exchange being built on NEO blockchain is set to the end of March 2019, not to mention already discussed OMG DEX and others. Waves platform’s decentralized exchange is a decentralized market where users can trade Waves-based assets, including Waves, Waves Assets, fiat tokens, and cryptocurrency tokens, such as wBTC and wETH. And although it is a currency-centric exchange, if is fifth in daily trading volume among the DEX’s listed by Coinmarketcap. Stellar Decentralized Exchange and Stellarport are also among the non-Ethereum decentralized exchanges featured on Coinmarketcap. The first is built on StellarTerm, an open source client for the Stellar network. It is a DEX of the first-generation kind, as it stores the order book and settles transactions on-ledger, and has matchmaking built into the protocol. The second one positions itself neither as an exchange, nor as a broker dealer, but as a sophisticated wallet service with Stellar Network analytics and a frontend ‘to submit operations to the Stellar Network’. The first generation of DEX’s was fully blockchain-based. Every update in the orderbook, be it a new order or an adjustment to an existing one, ought to be reflected in the state of the blockchain. But soon it became obvious that, however secure this method might be, protecting user privacy isn’t worth sacrificing speed and liquidity. Furthermore, such frequent and straight-forward interaction with the blockchain resulted in high fees and zero interoperability with other exchanges. EtherDelta was one of the most popular and oldest Ethereum DEX launched, thus, it still accounts for nearly 40% of all ETH dex transactions for all time. However, after being targeted in a 2017 hacks series, becoming a SEC’s guinea pig in targeting not truly decentralized DEX’s under the Exchange Act, and a relatively suspicious ICO of EtherDelta token, the platform lost a considerable portion of users and trading volume to alternatives. Nevertheless, the platform is still operational, even with updated UX, and now (in last weekly/monthly stats) holds stable third position in the number of transactions among the ETH Dex’s monitored by EtherScan, trailing IDEX and Kyber. In order to mediate the drawbacks of the first-gen DEX’s a compromise was found in trustlessly keeping the order books off-chain. In this approach, the execution of trades still occurs on the blockchain, but the order books are hosted by third-parties called Relayers. These relayers, being connected through the protocol, can create a more robust trading infrastructure by aggregating common liquidity. A market maker submits an order to the Relayer, and the trade is trustlessly executed only after a taker fills that order. Until then all funds remain fully under the counterparties’ control. The 0x protocol was the first to fully implement this logic and is even referred to as “EtherDelta with better coding and additional capabilities”. In 0x anyone can be an off-chain matchmaker by maintaining an order book, and market makers can set their own fees for managing the transaction through programmable smart contracts6. The most comprehensive solution of the order matching problem to date consists of using Smart Contracts and reserves (used on platforms like Kyber). Instead of off-chain matchmakers, all reserve transactions are managed by Smart Contracts. To provide liquidity a singular reserve is held by the platform itself, whereas additional reserves can be public or private. The former are continuously replenished by users’ contributions, who benefit by sharing in its profits. The latter ones are constituted by individual token holders, who provide their crypto to the exchange liquidity pool setting their own rates. The same principle of automatization is used on DAO-based platforms. The IDEX platform runs on top of the Aurora DAO, inspired by free banking. They’ve developed a multi-token structure, with IDXM (a membership fee token), AURA, and Boreal. AURA is the staking token for the multi-exchange protocol Snowglobe, used to pay and distribute platform fees. Boreal is a stablecoin for decentralized P2P lending. A direct competitor to IDEX, Oasis DEX, built by MakerDAO, was one of the few DEX’s operating completely on-chain. Being meant for assets in the Maker registry (currently MKR, DAI, and ETH), it aimed for similar DAO-level of decentralization as IDEX enjoys. However, the platform was recently shut down, as now the platform undergoes a complete rebuilt shifting its focus to enable the trading of Multi-Collateral Dai. 99% of cryptocurrency transactions still go through centralized exchanges, but the situation might be reversed already in the nearest future. 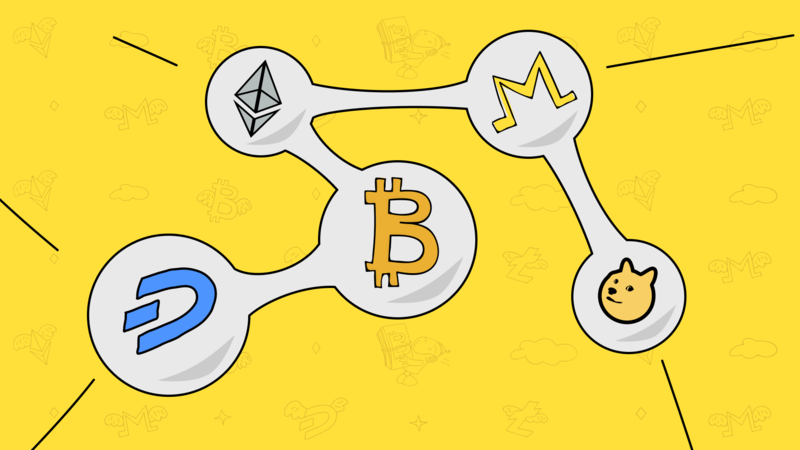 Switching to decentralized exchanges is in a way the only option for cryptocurrency users to exploit their full potential, aligning with the decentralized nature of blockchain itself. 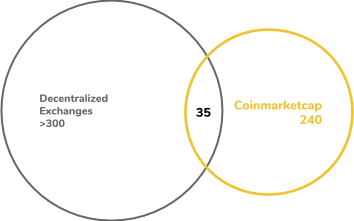 The trend is clearly evident as even centralized exchanges are shifting towards decentralized technologies since last year. In January, Huobi launched a beta version of the EOS-based decentralized exchange Huobi EOS, which will be one of the first DEX’s to use EOS as a base currency. In summer 2018 Coinbase acquired Paradex, and Bibox has followed the same strategy by recently buying 100% share of one of the biggest decentralized exchanges DEx.top. And although their level of decentralization might be questionable, there already exist “decentralized analogs” of major trading platforms. Bithumb DEX is based on R1 protocol relayer solution. Last week Binance eventually launched the Testnet of its much-anticipated Binance DEX, the rumors about which have been around since last March. A simple currency-centric DEX can be built on virtually any smart contract platform. However, thanks to the open protocols7, there are now multiple currency-neutral platforms as well. There are protocols designed for decentralized exchanges specifically, as well as the ones with more general purposes, which are still successfully used in DEX’s. Open Protocols are created to set up and run almost any decentralized application (dApp) by creating the environment which allows anyone to build their own services on top of the protocol. Through open protocols, decentralized exchanges create common liquidity pools by allowing any project built on top to interact with each other. 0x is an open protocol for DEX on the Ethereum blockchain. It is now live with multitude of relayers (i.e. OpenRelay) and dApps built. RADAR Relay is one of the most popular decentralized token trading alternatives built on the 0x Protocol. Created for Aurora DAO and subsequently used by IDEX, Snowglobe is another powerful fully-decentralized exchange protocol, designed for high-performance and creating decentralized childchain exchanges. The OmiseGo is a protocol for digital wallets, P2P exchange, as well as fiat and crypto payments. The OMG’s DEX layer is to provide the back end for easy exchange between digital assets on the OMG Network. It is going to be launched on Testnet soon with a ‘Restricted Custody’ mechanism in its first iteration. Enigma Protocol is a privacy protocol for scalable, end-to-end decentralized applications not limited to asset trading. Its first application is Catalyst — a platform for data-driven crypto trading and investing that supports cross-chain atomic swaps, providing an open infrastructure and trading tools. The developers of BitShares (and the famous BitShares DEX) created Graphene — a protocol for deploying decentralized ledgers. The AirSwap DEX’s team is also working on the Swap Protocol, a P2P protocol for trading Ethereum tokens without orderbooks. Lendroid is another example of many open protocols for decentralized lending that enables margin trading and short selling of ERC20 tokens. 1. Of all DEX’s currently in development or live, only Blocknet “BlockDX” claims to achieve decentralization on all four functions, and describes their order system as a “decentralized state machine”. 2. In a nutshell, such projects make identifiers and names self-sovereign to their owning entity. 3. In a nutshell, an atomic swap is a trade executed in a single operation, as opposed to two separate transactions (such as first maker sending one coin, then waiting for the taker to send their coin). 4. The data was retrieved from Coinmarketcap, INDEX, DappRadar and Etherscan on Feb 21, 2019. 5. They analyzed 7 major DEX’s built on Ethereum blockchain: IDEX, EtherDelta, Bancor, 0x, OasisDex, Kyber Network, and Airswap Protocol. 6. See more about 0x. 7. Source: Consensys Research, State of decentralized exchanges.